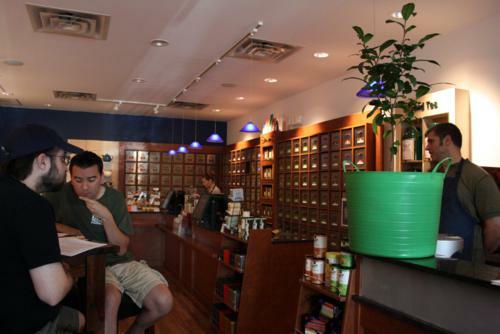 Tin Roof Teas is a heavenly store for fans of tea for a number of reasons. Not only do they have a huge selection of teas from all parts of the globe, they offer tea by the glass, all sorts of tea preparation tools and vessels, and most importantly for this post, tea tastings! The tastings are always held at 8:30 on Saturday mornings, though they don’t hold them every week. You must call and reserve a spot by credit card ahead of time, because people—like me—have a tendency to just say no to a planned tasting that early on a Saturday morning. It’s totally worth pulling yourself out of bed, though, if you’re a tea lover or you hope to learn more about it. Sometimes the tastings focus on specific types of teas whether white, yellow, green, oolong, or black, and other times on a preparation style like iced. On this day, the focus was general tea knowledge, dubbed Basic Tea 101. We were given thick packets of information on the tea plants, oxidation levels, production from leaf picking to tea packing, and well, anything you could want to know about tea. Ryan Hinson, one half of the brothers who own the store, deftly led us through the thick packet of material, pausing along the way for tasting one tea from each of the main types. The first was China Fancy White Peony, a white tea. 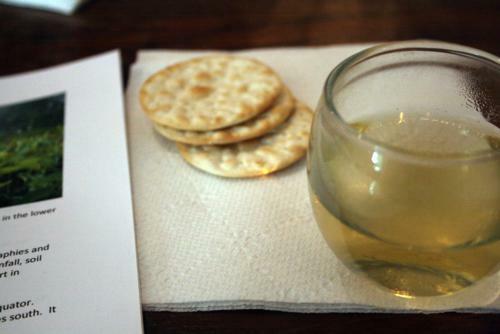 Make sure if you attend one of these to breathe in the tea before tasting—my wine sampling through this blog has done much to make me appreciate the smells of my food and drink, and tea should be just as reverentially noted. It was very light in presence. 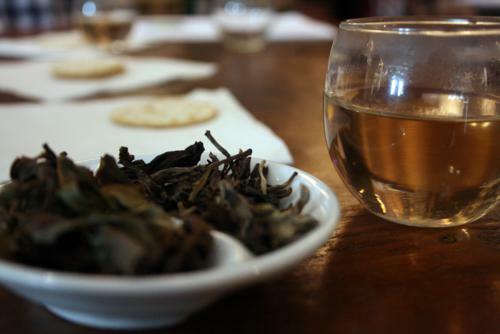 We moved slowly from less to more oxidation in tea, so a green tea was next: China Li Zi Xiang. As we enjoyed our teas, Ryan passed along the tea leaves with dried and steeped samples to compare the differences in smell and appearance. This green tea was only slightly more substantive than the white tea, and I enjoyed it a lot. 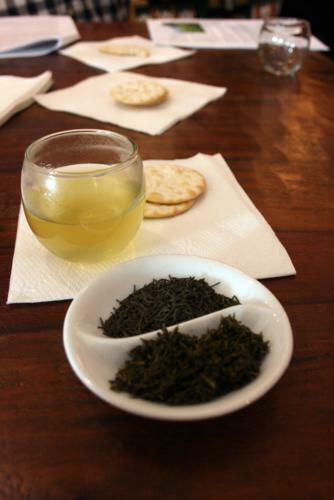 A Japanese green tea, Kokeicha, came next to compare it with the Chinese green tea. 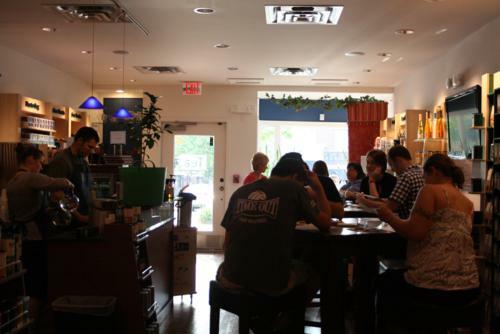 Ryan bought up a large stock of Japanese tea after their natural and unnatural disasters this year, so Tin Roof Teas hopes to have a good supply of Japanese tea for about two years. There was much discussion of how badly Japanese teas have been affected by the nuclear disaster. 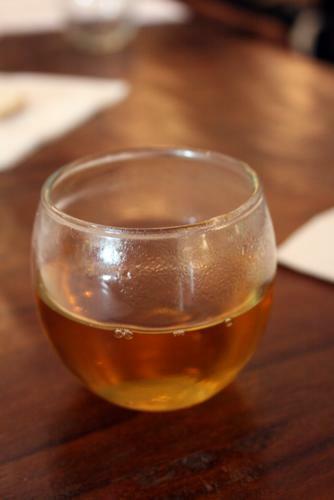 We then moved to oolong, the China Fancy Oolong to be exact. I noticed a large shift in flavor at this point, as more oxidation in the leaves affected the flavors, making them stronger and smokier. However, the oolong was still very elegant in flavor and so much better than the Chinese restaurant pots I associate with it from dinner out with Mom back in the day. We moved on to Chinese Yellow Tea next, which was actually more like a pink rose in color. This tea is not very popular due to a long series of steps in processing it. 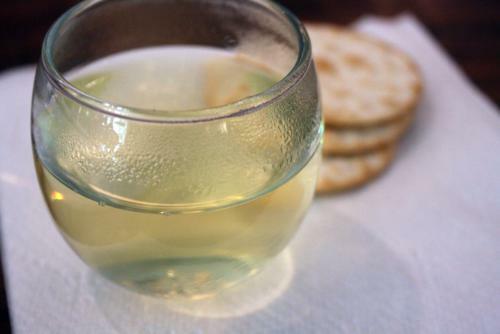 It’s appreciated more by local Chinese cultures than globally and is similar to white tea in oxidation levels. The last tea was Assam Marangi Second Flush, coming from India. Wow, black tea really stands out after a run of teas with much softer layers! As a lover of flavor, I welcomed the change, though I enjoyed trying each of the teas as they came. Of course, I can’t complain about the bite of fancy chocolate Ryan gave us to go along with it! 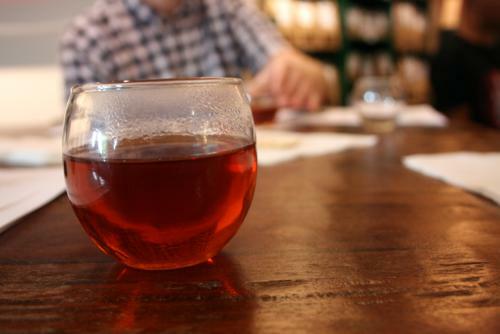 The group of people tasting with me was great—full of questions and generally folks who knew their tea far better than I do. I think $10 is totally worthwhile for the amount of education and number of teas tried, and you should definitely go if you’d like to learn more about tea. If you can’t make an early class, make sure you stop by the store anyway—Ryan and the staff know so much about tea and are genuinely excited to share different types each time I’ve been, instantly pulling out canisters and lifting scoops of tea for me to sniff to pick out which I wanted to try most. It’s one of those places where you know the people are passionate about what they do, and they deserve your tea-loving support. Tasting held on 18 June 11. Great write up! I hadn’t heard about this place but I certainly have to check it out! Thanks! Thanks for the heads-up on this place. Sounds like a neat experience. My wife loves tea so we’ll have to check it out. We’re thrilled to see this! Thank you! We look forward to sharing tea with you again soon! I was thrilled to drink it, Summer. Hopefully, you’ll get more interest than you have now. Next time I hear of an iced tea tasting, I’m in. Or mint teas, maybe?